Leaders of software-development projects face many challenges. First, you must produce a quality product on schedule and on budget. Second, you must foster and encourage a cohesive, motivated, and smoothly operating team. And third, you must maintain a clear and consistent focus on short- and long-term goals, while exemplifying quality standards and showing confidence and enthusiasm for your team and its efforts. Most importantly, as a leader, you need to feel and act responsible for your team and everything that it does. Accomplishing all these goals in a way that is rewarding for the leader and the team--while producing the results that management wants--is the motivation behind the Team Software Process (TSP). Developed by renowned quality expert Watts S. Humphrey, TSP is a set of new practices and team concepts that helps developers take the CMM and CMMI Capability Maturity Models to the next level. Not only does TSP help make software more secure, it results in an average production gain of 68 percent per project. Because of their quality, timeliness, and security, TSP-produced products can be ten to hundreds of times better than other hardware or software. 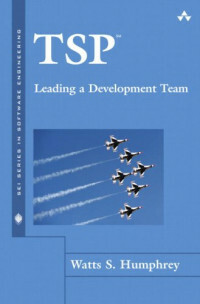 In this essential guide to TSP, Humphrey uses his vast industry experience to show leaders precisely how to lead teams of software engineers trained in the Personal Software Process (PSP). He explores all aspects of effective leadership and teamwork, including building the right team for the job, the TSP launch process, following the process to produce a quality product, project reviews, and capitalizing on both the leader's and team's capabilities. Humphrey also illuminates the differences between an ineffective leader and a superb one with the objective of helping you understand, anticipate, and correct the most common leadership failings before they undermine the team. An extensive set of appendices provides additional detail on TSP team roles and shows you how to use an organization's communication and command networks to achieve team objectives. Whether you are a new or an experienced team leader, TSPSM: Leading a Development Team provides invaluable examples, guidelines, and suggestions on how to handle the many issues you and your team face together.